Among the many exceptionally interesting data snacks in the recent MarketingProfs’ State of Social Media report is one showing that businesses of all sizes and types are primarily using Facebook, Twitter, Linkedin, YouTube, and blogging. There are literally hundreds of other places your customers could be talking about your brand within the social Web, and it’s imperative that you hear all of them. If a subset (even a small one) of your customer base loves Tripadvisor, or Yelp, or FriendFeed, or their Ning group or whatever, that does not make them less important to your brand’s perception than people on Twitter or Facebook, it just makes them a different segment of your audience. Remember, there is a REASON they spend their time within the social ecosystem on Yelp and not Facebook – because that’s the community they PREFER. And in fact, people that make choices that are less conventional tend to defend those choices more passionately than the “me too” crowd. And, because there are fewer total users, the opinions of any individual are magnified. Further, regardless of where the content is posted, it will be found and indexed by search engines, becoming part of your brand’s permanent record, like that crappy tattoo of a hummingbird you got in Cancun. 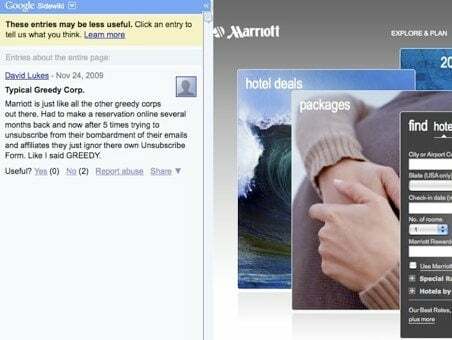 Consider this horrifying example for Marriott. I did a quick check of Google Sidewiki (a plug-in for Firefox and Internet Explorer that lets you comment on Web pages, and those comments are “stuck” the Web page like a Post-It note). I found this solitary post, ripping Marriott for not removing this guy from their email newsletter list. I’m not sure what’s worse, the company not paying attention to secondary and tertiary layers of the social Web and thus not finding this, or knowing about it and not leaving a reply. Either way, their silence is deafening. Do millions of people use Sidewiki? Not yet, but since it’s a Google project, there’s a fair chance it will take off. And for the people that are already using Sidewiki, doesn’t this impact how you perceive Marriott? And now I’ve shared it with all of you, so a comment on a “minor” social outpost continues to fester, unabated. I realize it’s a hassle to monitor your brand across all of these places. It takes time. Time you probably don’t have. But you know how municipal police forces crush graffiti problems? They paint over it immediately, wherever it occurs. It’s a lesson that applies equally in social media. The days of “if we answer back, it just gives them credence” are over. Take off the blinders, remove the earplugs, and defend yourself.